Cider Mill Press, 9781604338263, 320pp. Famous for its tropical climate and vibrant nightlife, Miami has been a go-to destination since the railroad could deliver travelers there from all over the United States. Today, the Magic City has become an international beacon for art enthusiasts, fashionistas, foodies, and nightlife aficionados, making for one of the country’s most dynamic cocktail scenes. Miami Cocktails takes you inside the city’s best bars and introduces you to bartenders and mixologists conjuring up drinks that reflect the myriad influences shaping the city today. 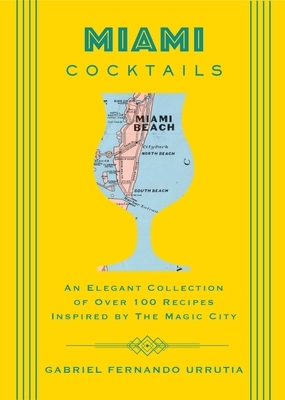 Featuring over 100 recipes that honor and reinvent classics and make the best of all the fresh, year-round local produce, this book is the ideal cocktail enthusiast’s guide to drinking like a local, whether you’re making a trip to Miami or staying at home and simply wishing you were there. Gabriel Urrutia is an award-winning veteran of the spirits industry, filling every role from mixologist to consultant. His coverage of the Miami cocktail scene is featured in Edible South Florida and on the popular Spirited Miami blog, which he founded.